It's all so easy to enjoy the golden sands and clear clean sea that the Costa Blanca has to offer. Starting with the search for the chosen spot is all so important, plant the umbrella, make home for the cool box and lay the towel, marking your territory your place! Whether it be sitting and not doing anything other than relax and recharge, listening to the sounds of the wave caressing the shore while drifting in and out of a dreamy nap, taking a stroll, building sandcastles with the children or grandchildren, playing a game of racket ball or volleyball, reading a favourite novel or simply passing the hours people watching, you are guaranteed a wonderful time. During the summer months in the larger of the coastal towns Chiringuitos (beach bars) are erected, some smaller than others, some discreet, some playing music and others that are so peaceful that you just sit back on the shore and listen to the calming sounds of the Mediterranean. Try them all until you find a favourite!!! If you are looking for something a little more adventurous, Kite Surf is the newest sport to hit the Costa's, on any given day when the wind is slightly higher than your normal hairdryer speed you will find the enthusiasts flying high above the waves of the Mediterranean bouncing along the sea with finesse. The combination of surfing and kite flying is an energetic sport and is equally exciting for the spectators. There are kite surf instructors and clubs if you wanted to enrol in some beginner's lessons, ask those already taking part in the sport to find out who can teach you. Remember to apply plenty of high factor sun cream before setting out for a day on the beach, the Spanish sun during the summer months can be very strong, you will also find as the famous saying goes "Only Mad Dogs and English men go out in the mid day sun" that between 1pm and 4pm the beaches are less crowded as the Spanish go home to eat and siesta in this time, perhaps a good lead to follow. 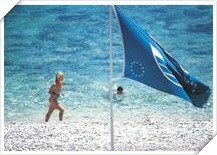 The Blue flag of water and beach quality flies over the beaches of the Costa Blanca, Costa Azahar and Valencia Terra I Mar. The sun shines over the Mediterranean for almost 3000 hours a year, creating sensational and often dramatic sunrises and sunsets. The most well known beach in Alicante is that of San Juan which is famous for its fine sands and is located to the North of the city. San Juan has a big range of facilities and services including the rental of catamarans and windsurfs. Laying adjacent to the city centre you will find Postiguet beach which was once a former spa. If you are looking for the liveliest part of town then head towards the port with has many bars, restaurants and discos to choose from, as well as the yacht club and marina. In the Marina you will find a diving centre, boat charter companies and even learn to do some dinghy sailing. Extending from the wide bay of Mascarat follows a succession of coves and beaches as far as the ports breakwater which brings you to the edge of Alfaz del Pi. Altea has an excellent range of sports activities with a diving centre, sailing school and boat charters. All of the beaches and coves of Altea offer superb services. Levante Beach in Benidorm is without a doubt the most famous in Benidorm if not the Costa Blanca. A wide beach 2km long is one of the most bustling beaches and can often get crowded in the summer. Due to its location its possible to sunbathe all year round and late into the afternoon during the winter months. Decorated with palms and boasting clear waters and fine sands Levante Beach is a big favourite for many visitors and only 40 minutes from Pego. An attractive coastline of fine sandy beaches and rocky coves and clear waters. Les Bassetes to the north of Calpe is a natural shelter providing the perfect setting for learning to sail, a sea bed carpeted with interesting underwater plants is perfect for diving. Calpe is overlooked by an enormous rock, The Penon de Ifach which in fact is a nature reserve and could make interesting climbing for rock climbing enthusiasts. A Bustling and busy port town which includes a fishing area, yacht club and Denia Marina. The beaches of Denia are ideal for surfing as the winds often are strong and south westerly during the afternoon. Not forgetting the ferry services from Denia to the Balearic Islands you will be able to take advantage of dinghy, sailing and diving class facilities plus boat rentals. A varied coastline with sailing diving or swimming being a special experience. Boats are available for hire at the port. The rocky coast with crystal clear waters to the south of the port make it perfect for diving while the long sandy beach is a fantastic location to lay your towel and do some serious sunbathing.